It was fun to trip around on the Oregon coast and then in Portland for a few days, but I'm always happy to be home, where I sleep better and where the best noodles are! I have fond memories of Hon's in Chinatown where my Chinese food horizons first began to be expanded beyond the Rick Shaw in Whalley and chicken chow mien (read about the Rickshaw in our first blog post almost a year ago). 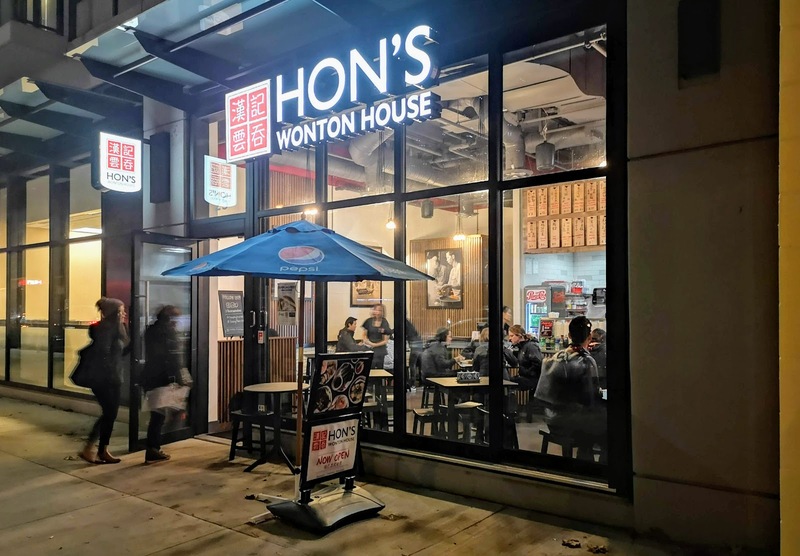 Alas, the Chinatown Hon's was closed some time ago, but there are other locations. We visited the Olympic Village restaurant as part of Vanfoodster's Dumpling Fest in November of this year. 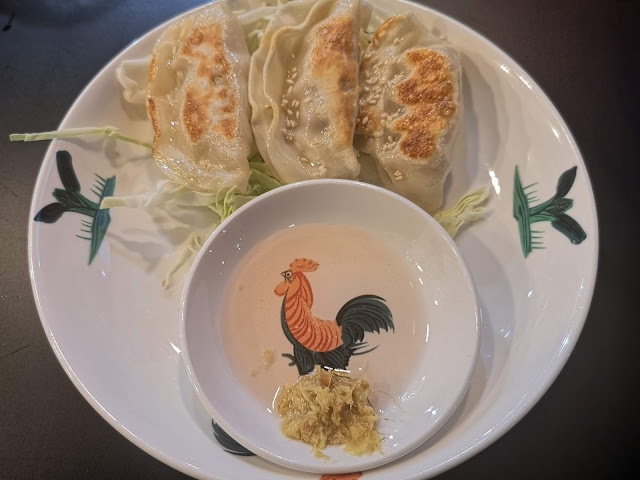 On that occasion, we enjoyed Spicy Wontons and Pork Potstickers. That little visit moved me to add Hon's OV to my 'list' and I have been anxious for us to return. This being soup weather, we finally stopped by to get warmed up! 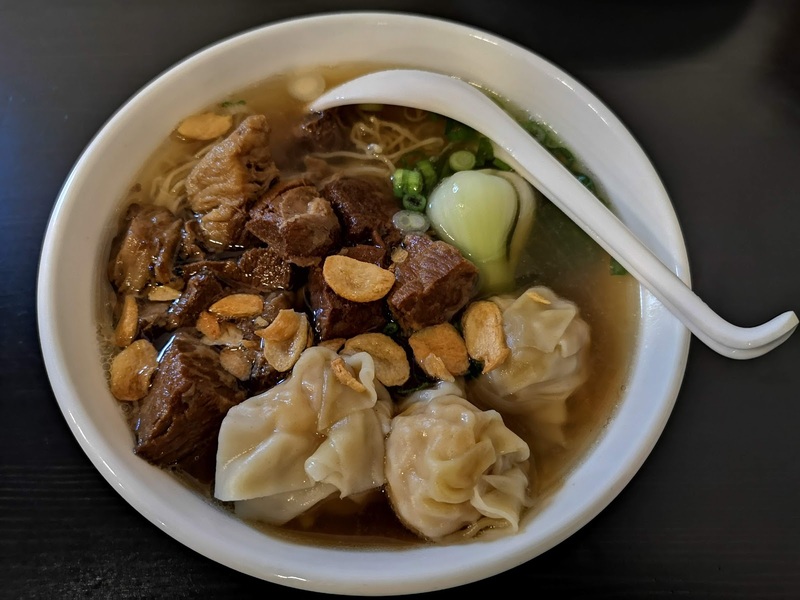 Marie chose the Brisket and Wonton Noodle Soup. It came topped with fried garlic slices which turned good soup into great soup! The brisket was tender and tasty, the dumplings had some shrimp chunks which still had just a bit of snap, the greens were nicely crispy while the broth had some flavour. And then there were some pretty decent noodles! Great soup! 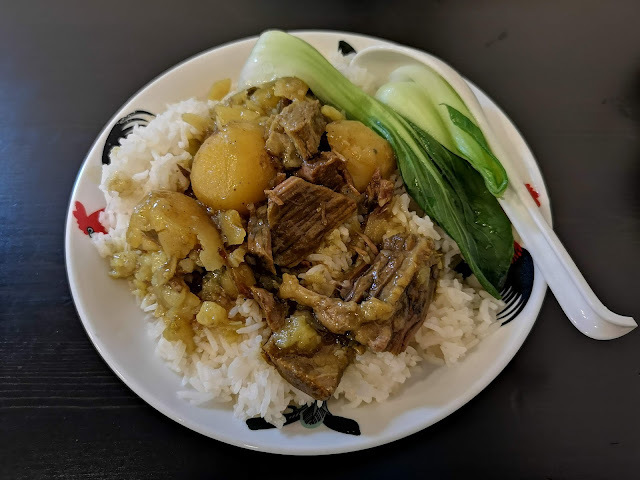 I had one of the dishes that started it all for me at Hon's in Chinatown, Curried Beef Brisket on Rice. With just a touch of heat, the brisket and potatoes were delicious although the brisket was a touch on the chewy side. Finally, we had a side of Barbeque Pork. This was very good. I would say that it seemed to have a bit of molasses flavour but I'm sure that it probably has more to do with five spice and the combination of other ingredients. I listen closely when I hear Neil deGrasse Tyson speaking. I was surprised to hear him declare the merits of Shake Shack when compared to In 'n Out burger so I knew we had to check it out. 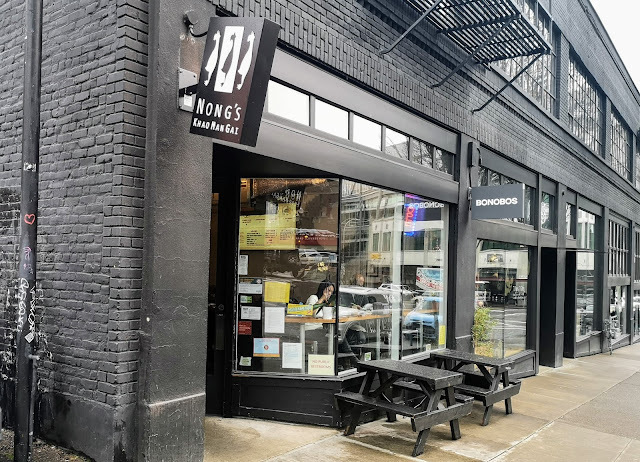 Considering that there are almost 70 international locations in countries including China, Russia, Saudi Arabia and Turkey to name just a few bastions of human rights, it is surprising that this is the first location in the Pacific Northwest. 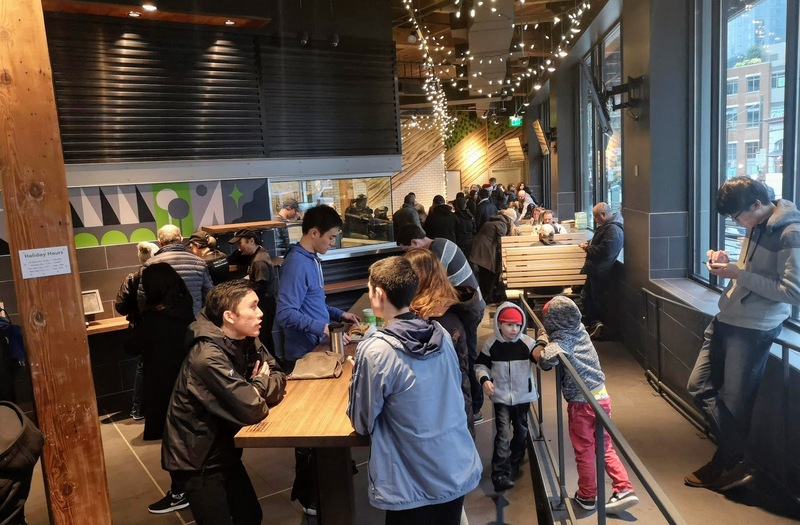 We came expecting a line up and indeed it was 30 minutes from getting in line to burger so not too bad for a relatively new place with a lot of buzz. Inside, you order at terminals then wait and maybe hope for a table to open up. We got ours to go. 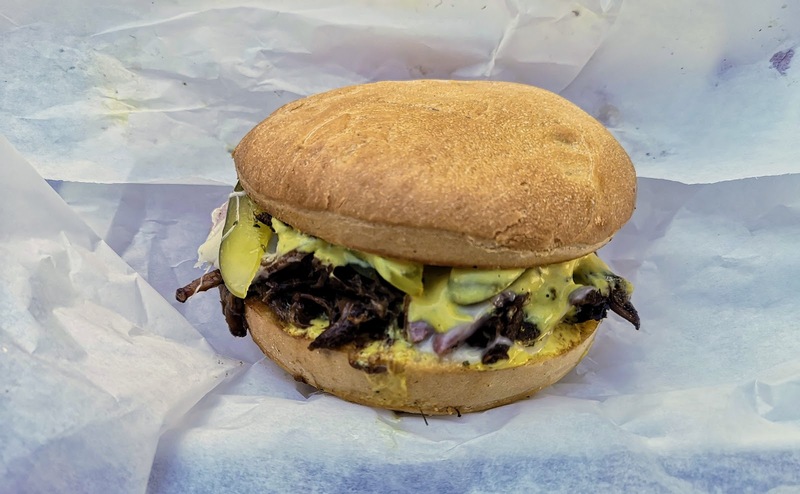 A Smoke Stack, a Hot Chicken, a grilled cheese, fries and a water came to about $34 CAD. The Hot Chicken which came to $10 CAD, was not a patch on what $13 gets you at DL Chicken in Vancouver. While there was a bit of kick, you have the option to make it much spicier. There was a generous piece of chicken but it was on the dry side. The pickles were great but I wouldn't come back for another. Next was a single Smoke Stack. At the same price as the Hot Chicken ($7 USD) this was a tasty burger. The bacon was smokey and a few peppers added some zing. The beef itself was nicely cooked (not cooked to death) and beefy, and they were not cheap with the cheese and bacon. 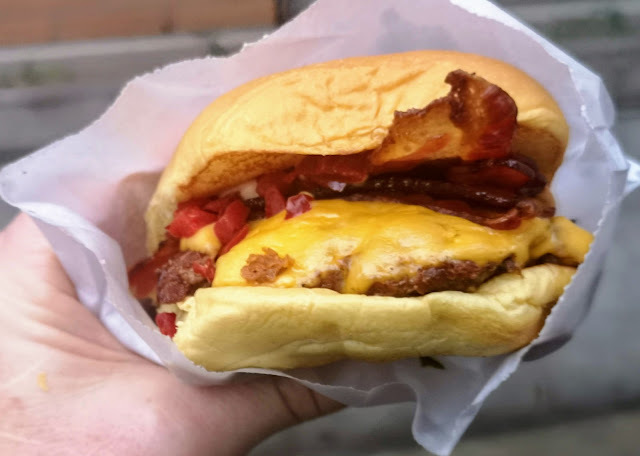 I'm not sure what to compare it with as there is no bacon at In 'n Out where a cheeseburger is two and a half bucks but I'm gonna say they have a winner in the Smoke Stack. I'm not sure what happened to my Grilled Cheese. Perhaps someone sat on it as it didn't look like the picture on the menu and I couldn't save it with my own photograph. It was delicious however, nicely toasted and buttery with lots of melty cheese. As for the fries they were just fries and nothing too special. 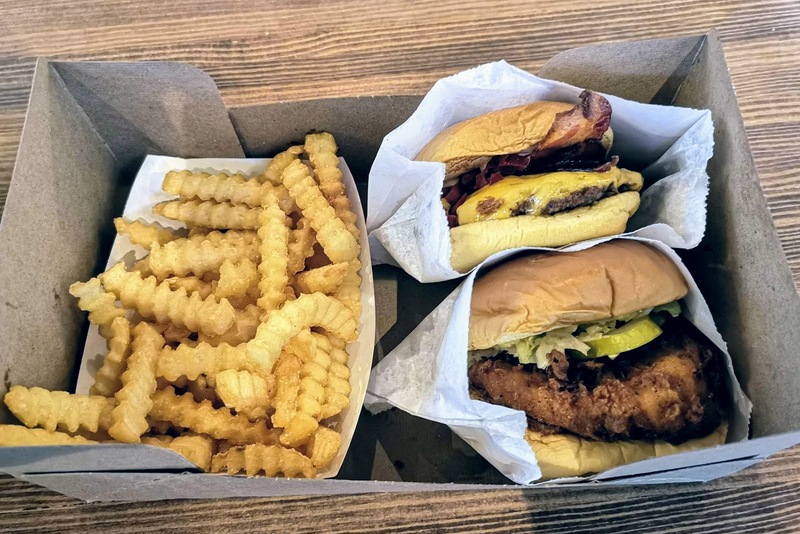 So we gave Shake Shack a try. 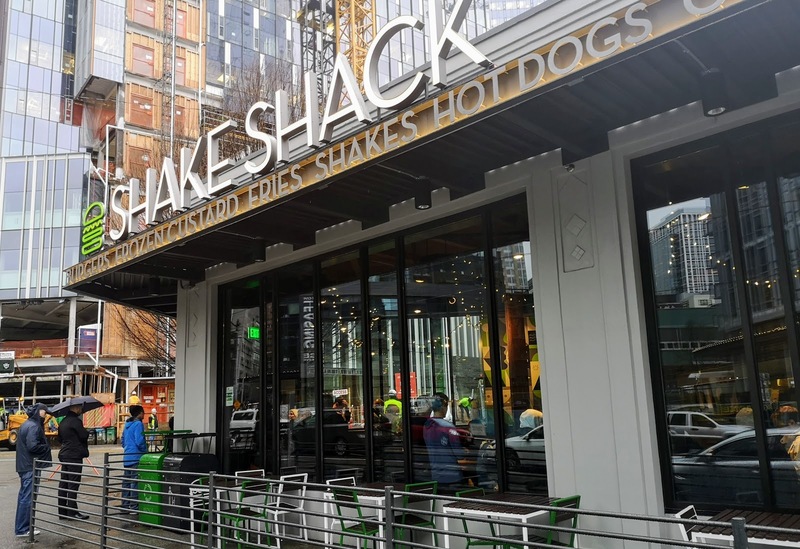 I'm not really sure why the debate is In 'n Out vs Shake Shack. While the former sticks to a simple menu, is quite a bit less expensive and is still amazing, the latter has a much more ambitious menu, costs a few more pesos and is also pretty good. I guess it depends on what you prefer but I will cast my vote for In'n Out. Sorry, Neil deGrasse Tyson! 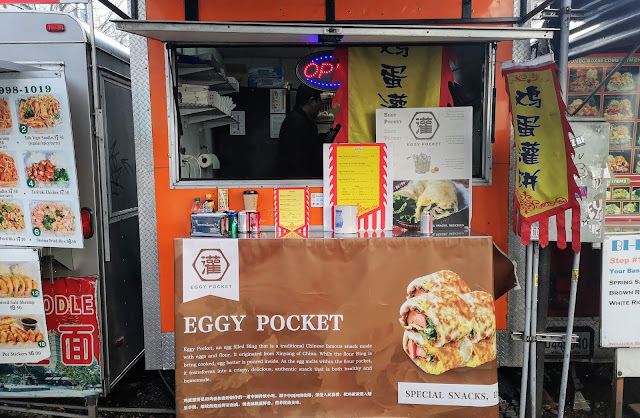 Less common than the popular pub crawl, a food cart crawl can definitely be a thing, especially in Portland, the food cart capital of the West! 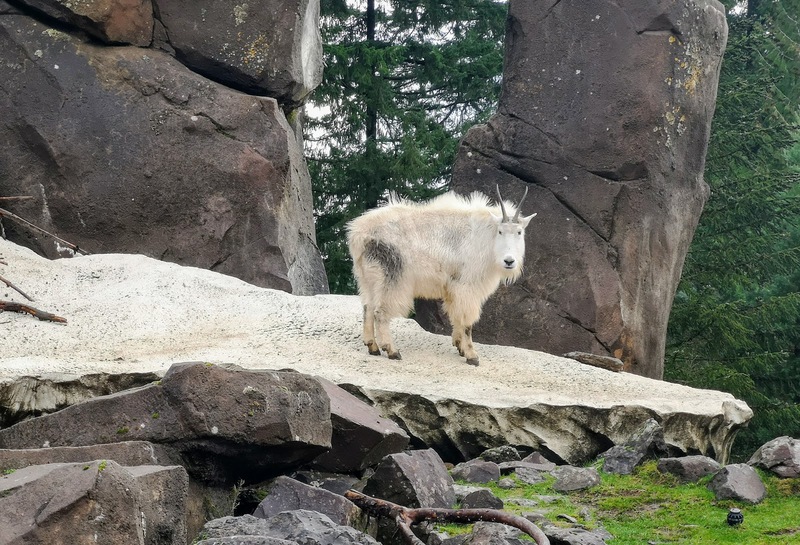 So we spent the morning at the Portland zoo, which seemed to be about 50% an active construction site. We did enjoy the rest of the zoo and saw some very cute Hyena pups but they were just too wriggly and a little too far away to get decent pictures. Sorry! 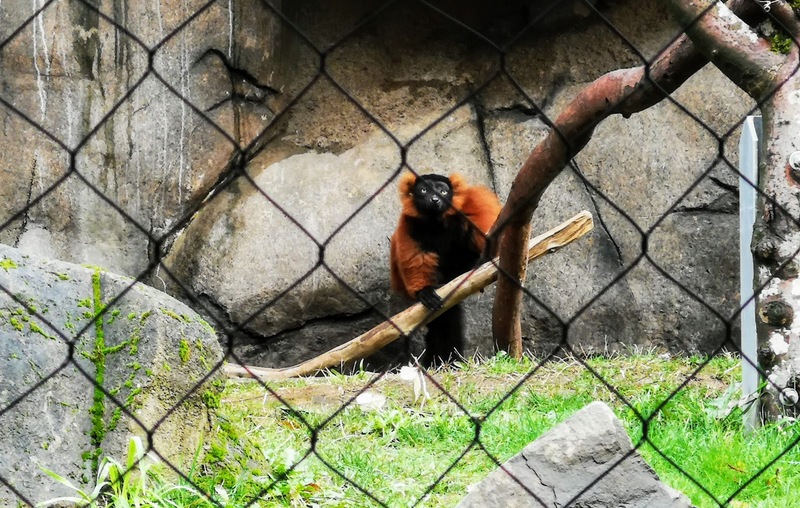 This lemur was cute too as were the mountain goats and..well you've been to a zoo before. 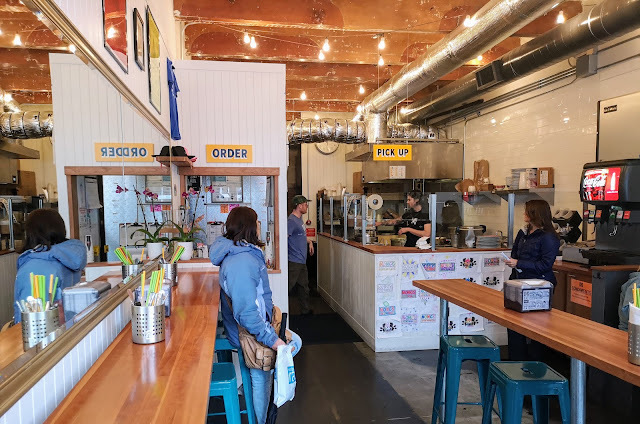 So we caught Max Light Rail to the downtown area and began our search for something interesting to eat. My usual rule of not eating Asian food when not in Metro Vancouver (or in Asia obviously), was vigorously ignored. 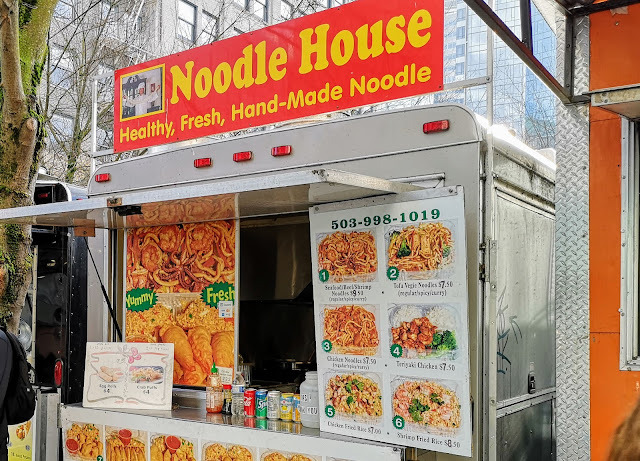 For one thing, Marie wanted noodles! 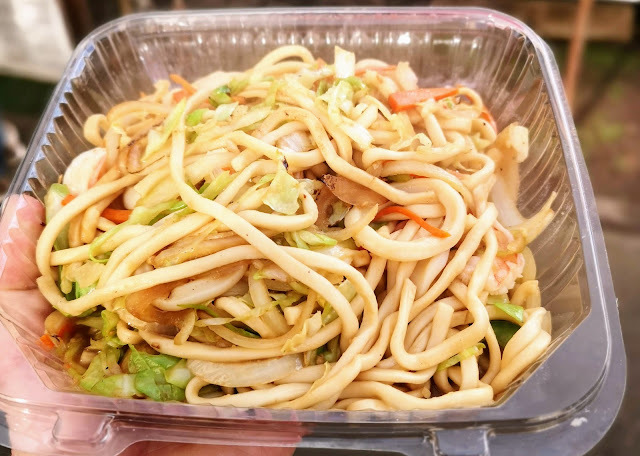 The Seafood Noodles consisted of 3 or 4 shrimp and some squid in addition to some decent chewy noodles and vegetables. Something is happening such that probably 60% of all the carts are now gyro / falafel / pita / middle eastern leaning, which is fine but I was looking for something different. I thought I had found it in the form of Eggy Pocket. But it turned out to be a lot like something I had at the Richmond Night Market this summer. 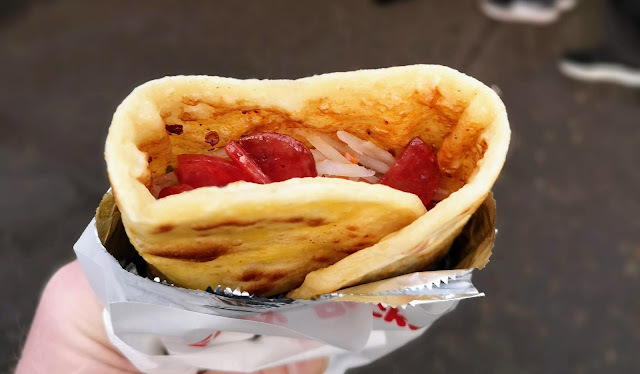 Sort of a pita but 'eggier' and in this case filled with Chinese Sausage, sprouts, etc. I enjoyed it. It had a bit of spice to it. Further along, I found the Cubano that I had been thinking about at Sandwich Cartel.. It didn't turn out to be the panini pressed version that I was hoping for but it was tasty with pork, ham, cheese, mustard and pickle. So nothing earth shattering from the food carts but there was still Voodoo Donuts! We've been here before and weren't surprised to see a line. 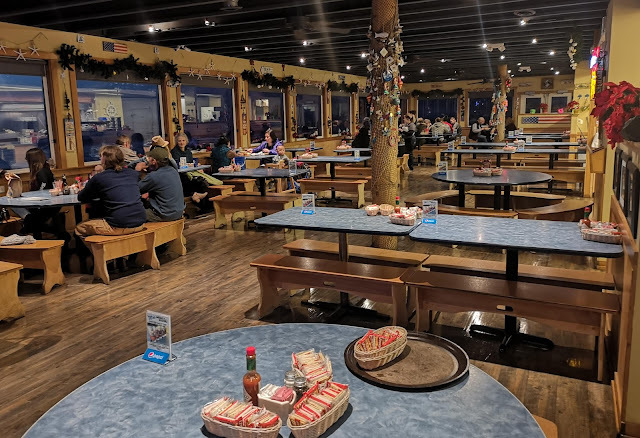 We were surprised however, to get in and out with a half dozen for $15 in about half an hour! Well worth the effort! 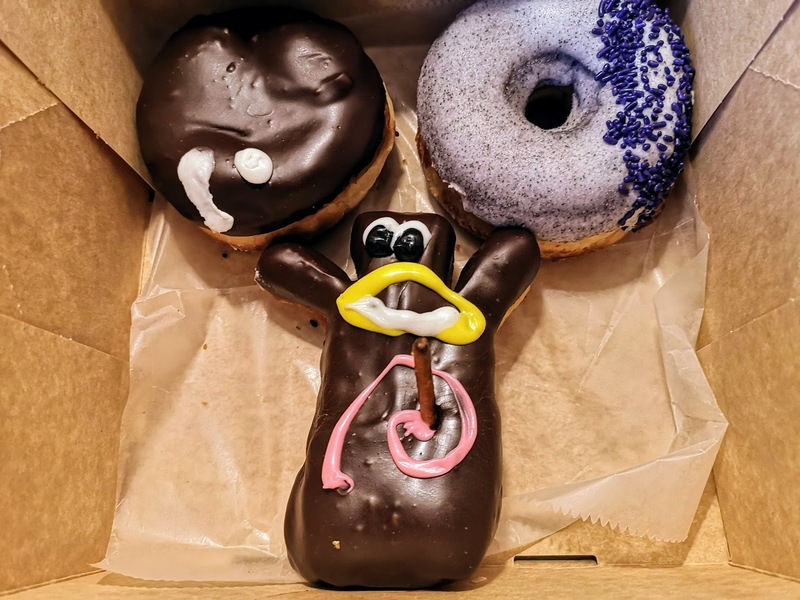 The Voodoo Doll donut did not seem as dangerous as its name. 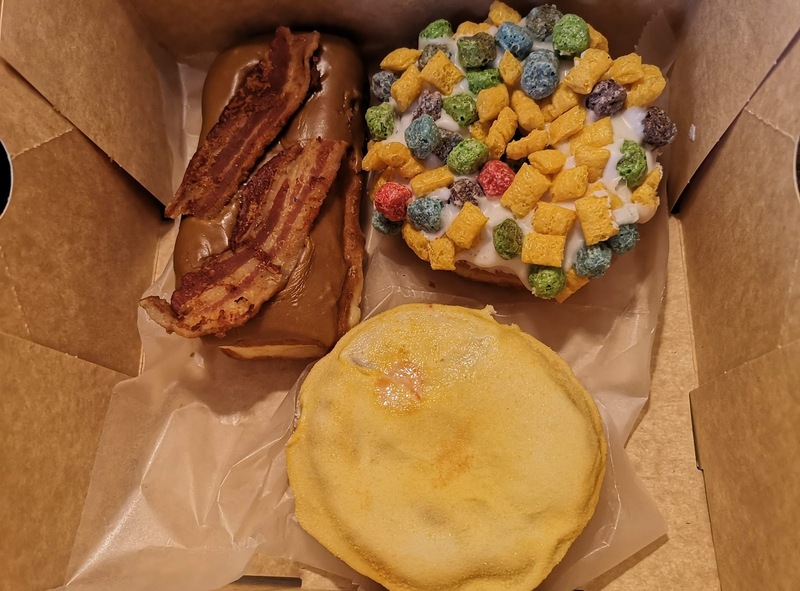 The Oh Captain, My Captain (Captain Crunch) was my favourite but it is also hard to argue with bacon on a maple bar as a solid concept. By the way, for $130, you can walk out with a hand made wooden coffin (too small to be practical) and 3 dozen donuts! Perfect for your next party! This is a mostly G rated selection but quite a few of the donuts are suggestive or occultish in nature. Not sure why you would need that but if you do, its nice to know that its available. 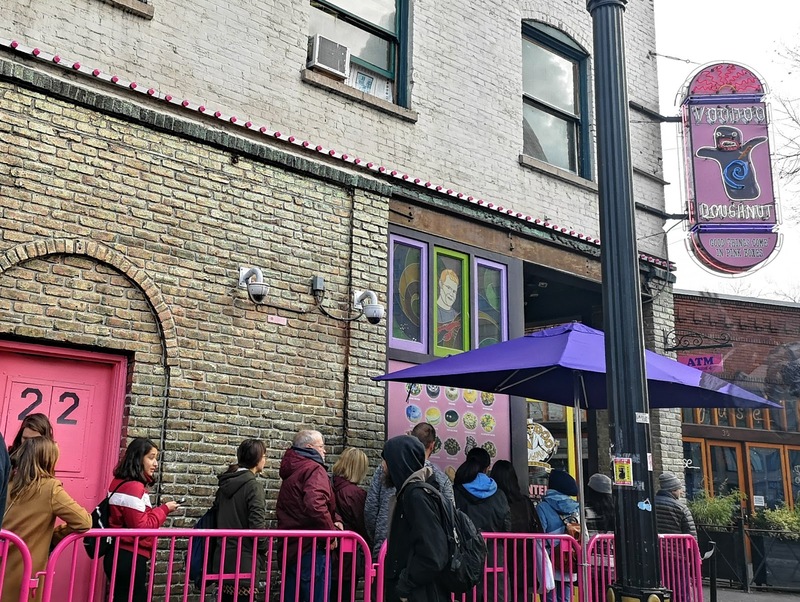 You have to visit Voodoo Donuts at least once when in Portland! No trip to Portland would be complete without at least a couple of food cart visits. We decided to try Nong's Khao Man Gai because there has been a lot of local buzz about it. As it happens, these folks have expanded from food carts into brick and mortar locations. Due to conflicting web site and business card info, I honestly can't figure out how many locations that they have. Possibly as many as 2 carts and 2 restaurants! 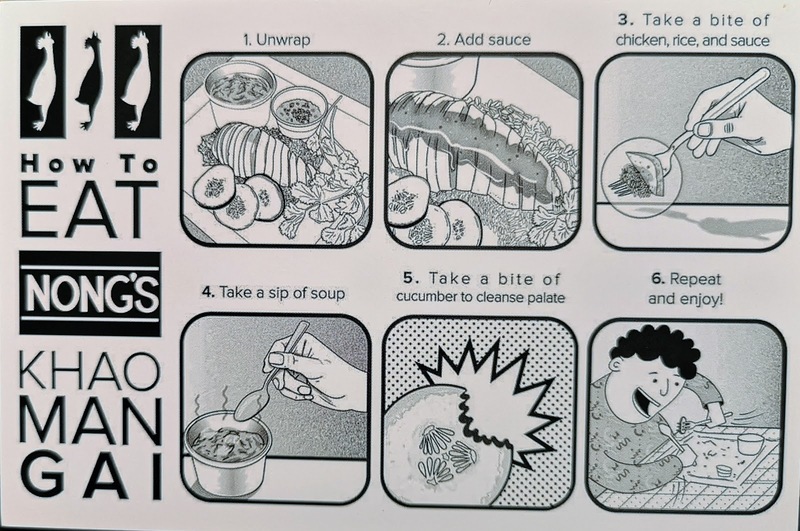 The basic and delicious product is Thai Chicken and Rice and they provide handy instructions into the proper procedure for consumption! It is not nearly as intuitive as you might think! 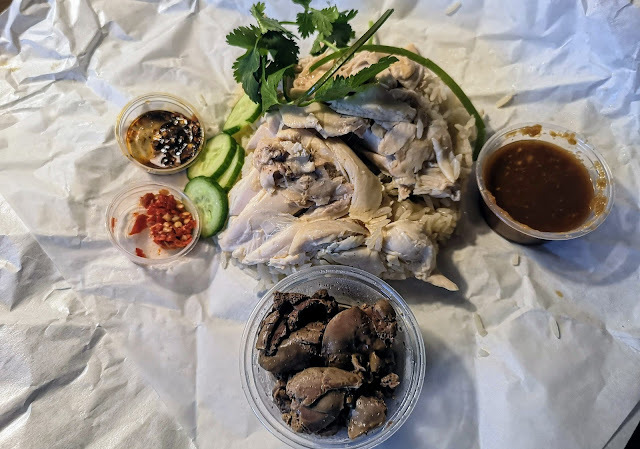 We ordered the basic Khao Man Gai, shown in our photo with a side of chicken livers. 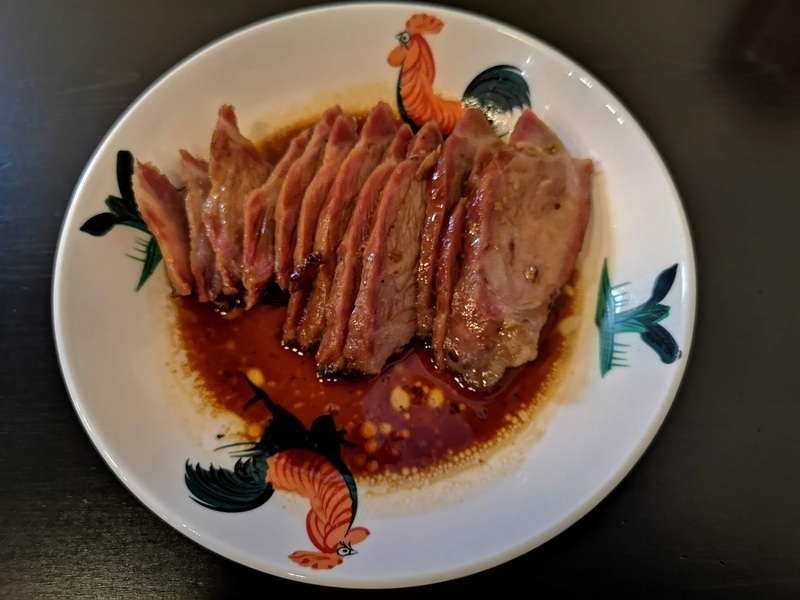 The excellent powerful sauce is a mix of fermented soy beans, ginger, garlic, chilies, vinegar, syrup and soy sauce. It is unique and delicious! The rice is perfect and the chicken is nicely poached in stock and very tender. They include a couple of minced chilies on the side with which you can render this a blazing hot dish should you so desire! They offer a few variations on the basic theme and some sides you can order. 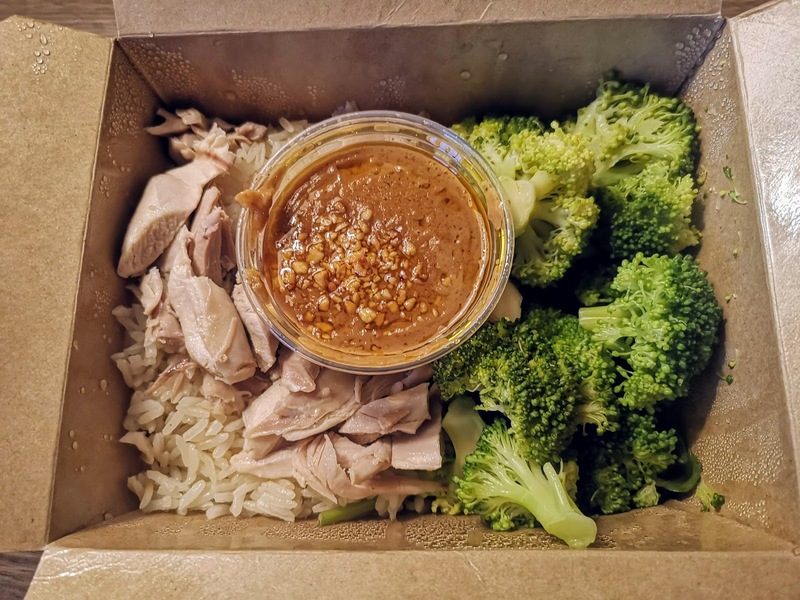 We tried the Chicken with Peanut Sauce which came with steamed broccoli. 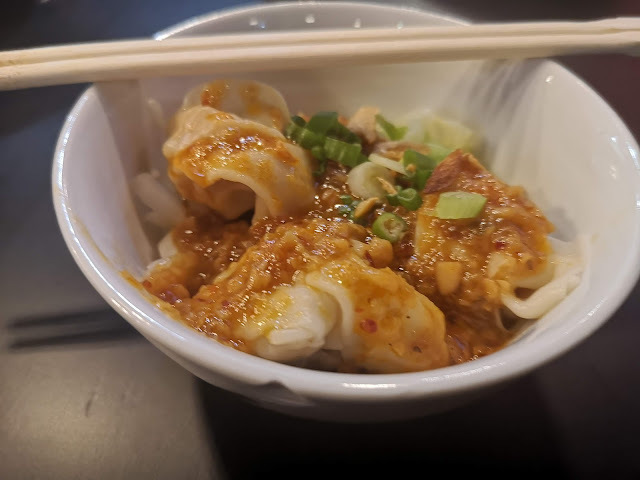 The peanut sauce was excellent and full of texture. I would put this on anything! We got ours to go but the restaurant on 13th and Burnside is perfectly comfortable with a few booths and some bar stools. 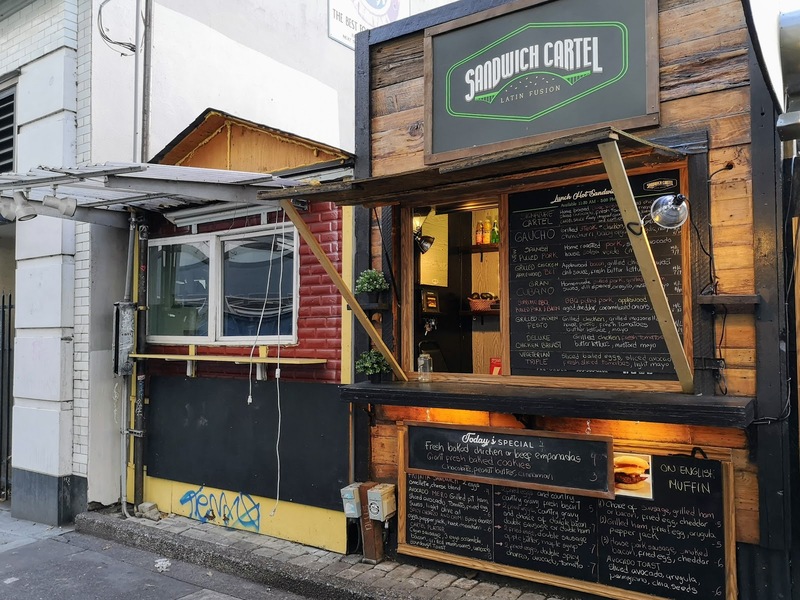 I would eat here often if this was my neighbourhood! 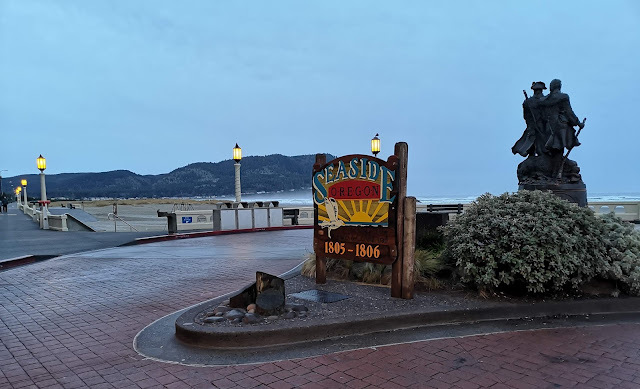 The weather was mild and precipitation free for our couple of quiet days in Seaside but it turned a little nasty as we set out for Portland. We had kind of planned a zoo day but this was not to be. That doesn't mean we're not going to eat! 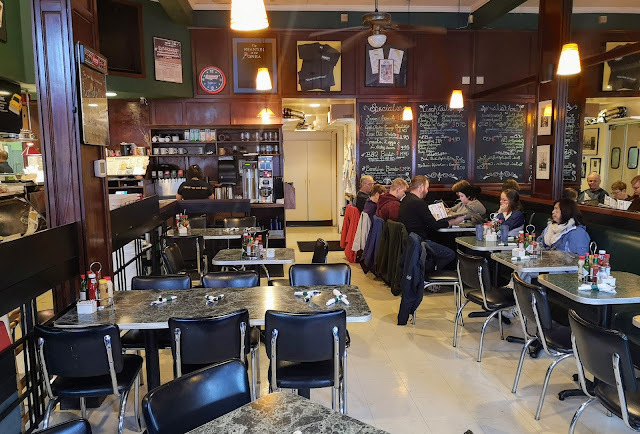 I have been here before but I wanted Marie to enjoy Kornblatt's Deli too. They told us that the portrait of Kramer was on the wall because, back in the day, they used to be all about Seinfeld. They even served a Big Salad (and muffin tops?) and folks would pack the place on Thursday evening when new episodes aired! They still crank out the same great stuff but with out the references. 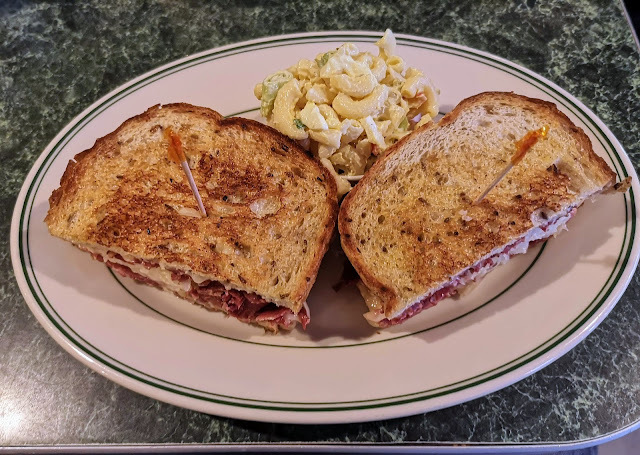 We had a classic Reuben and they did not cheap out on the corned beef. With a nice side of Macaroni Salad, this was worth the trip all by itself! 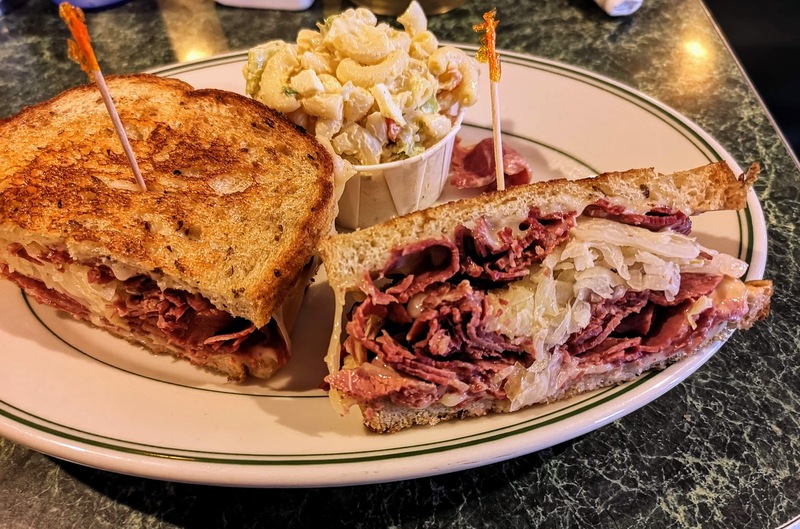 Lovely melty Swiss cheese and just enough sauerkraut and Russian dressing. A comfort food classic! 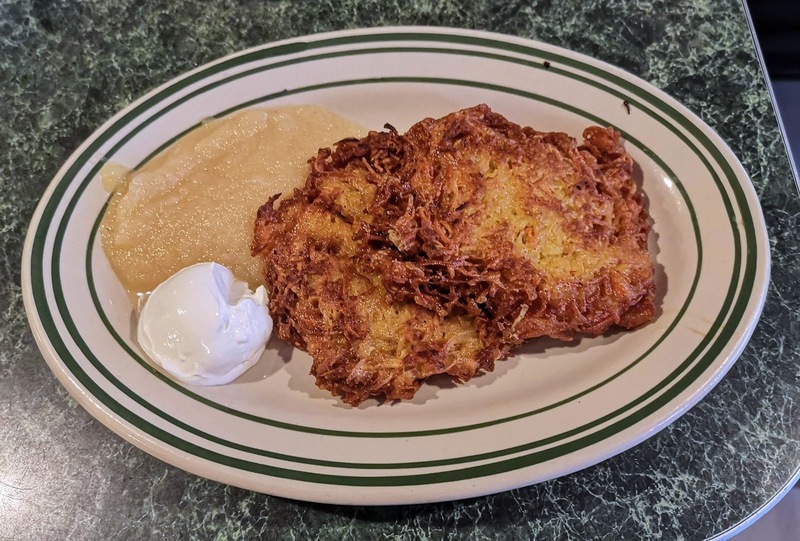 They had no Matzo Ball Soup to our chagrin so we decided on Latkes instead. That worked out well as Marie has a new favourite! These were rich and crispy and topped with wonderful applesauce and sour cream made them a memorable experience. 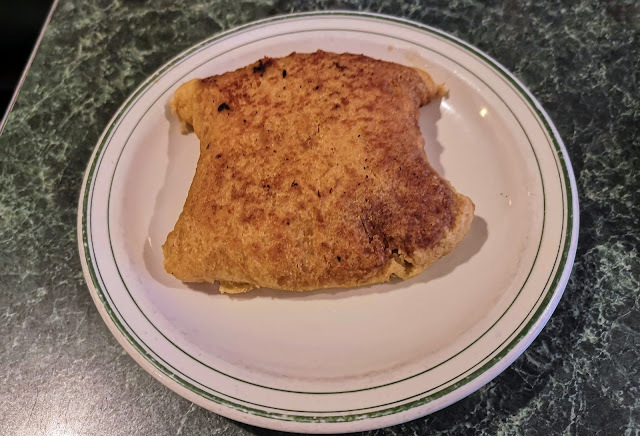 We tried a Knish and that was just meh. It was probably a good knish but its not something that we will dream about. 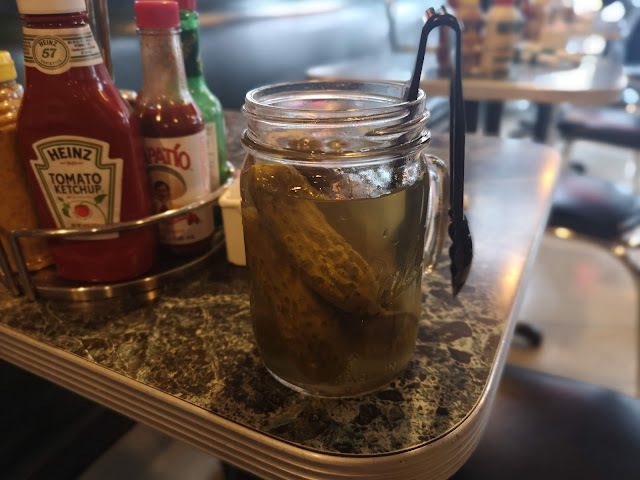 I may however dream about the mason jar of excellent dills that were placed on our table! 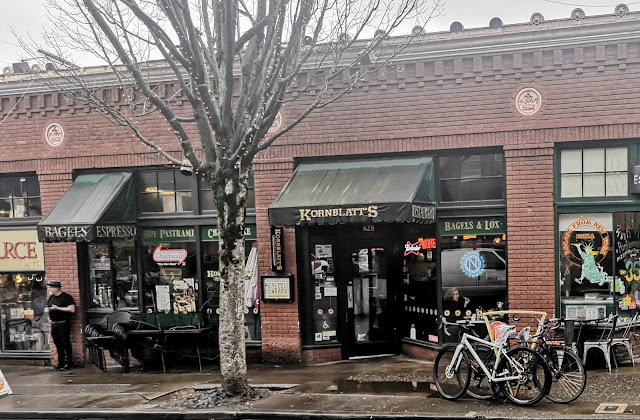 I can hardly wait for our next visit to Portland just for a return visit to Kornblatt's! This place is full of character and these folks were so friendly. 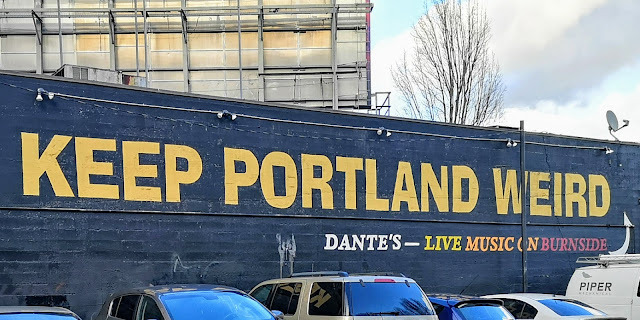 Definitely plan a stop if you are in Portland! Decidedly non-traditional holiday weekday 2 started with coffee and a long walk on the expansive beach at Seaside. 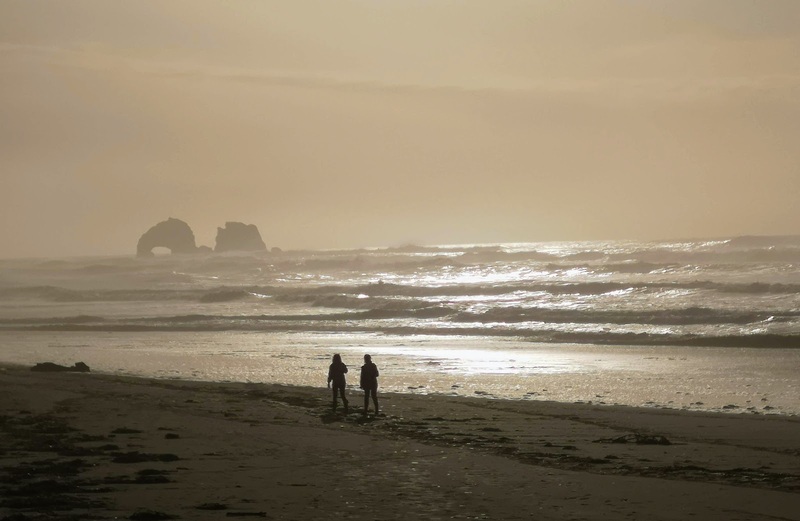 What is it that draws us so powerfully to the ocean? 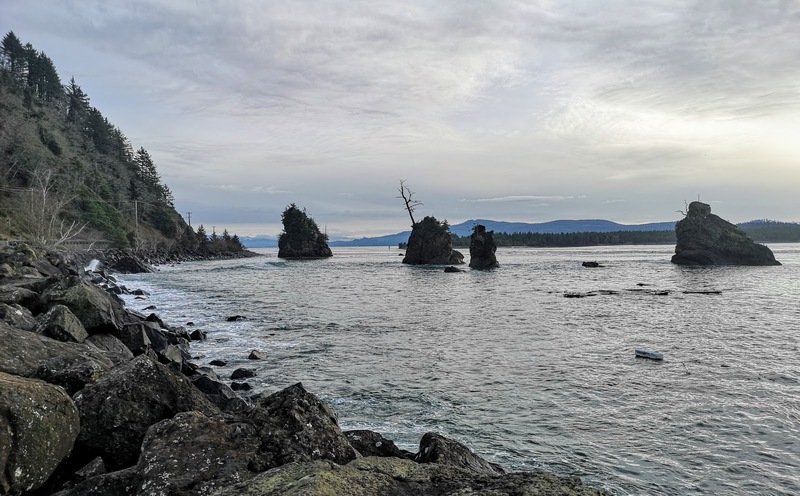 I cannot get enough of crashing waves and both rugged and sandy coastlines even in the chilly Pacific Northwest in the middle of winter! We decided on a little drive down the coast as far as Tillamook and then to crawl back, stopping for vistas. So skip ahead an hour, we found ourselves in front of Tillamook Creamery. 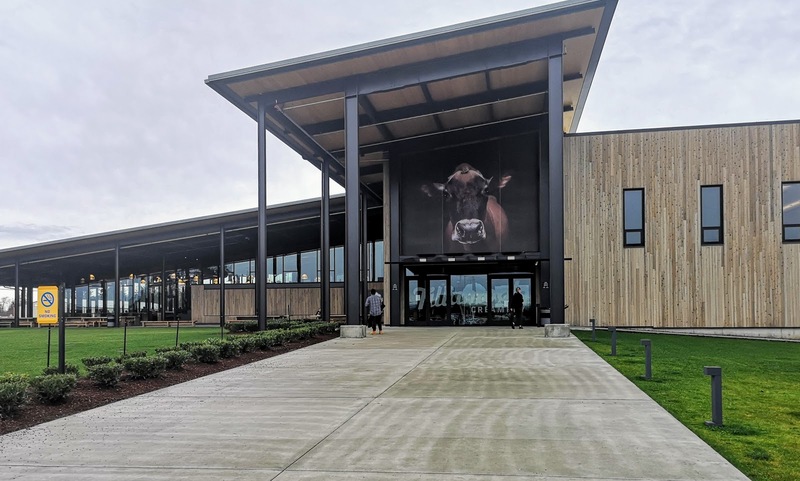 You can learn a lot about dairy here by taking a self-guided tour and watching the cheese making process. It is quite impressive. 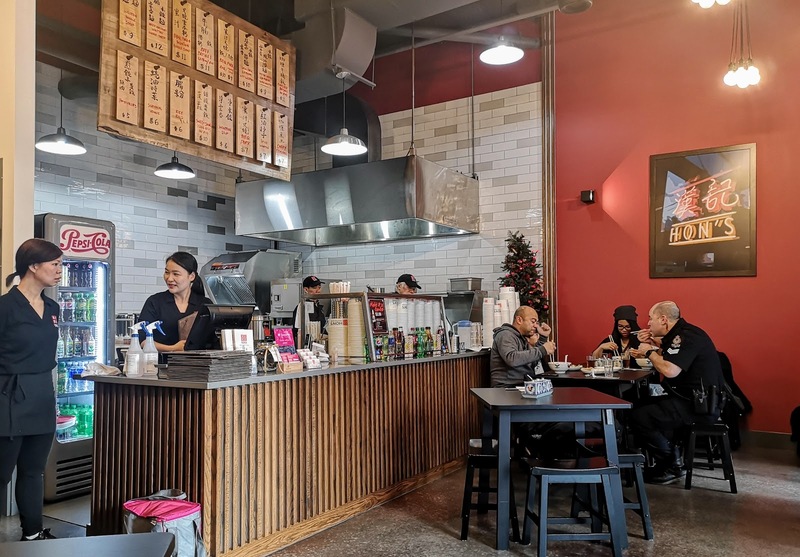 We figured that since they are promoting their products that might serve up some decent eats and we were not wrong! 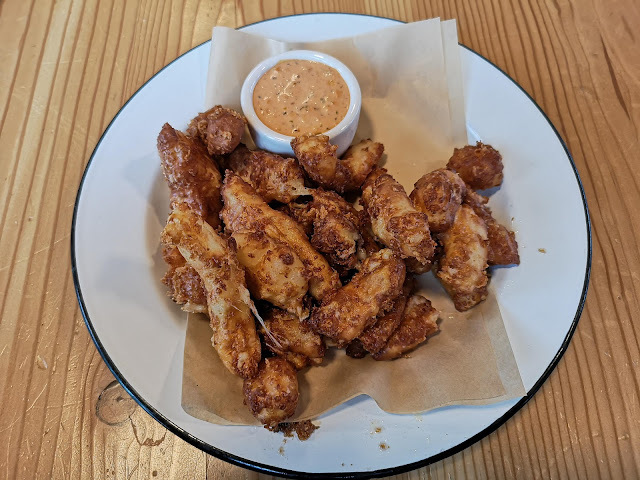 We tried Tempura Fried Cheese Curds (proof that poutine is the only option) that were served with a spicy chipotle sauce. Very nice! When I dream of perfect Mac and Cheese, this is what I dream about! 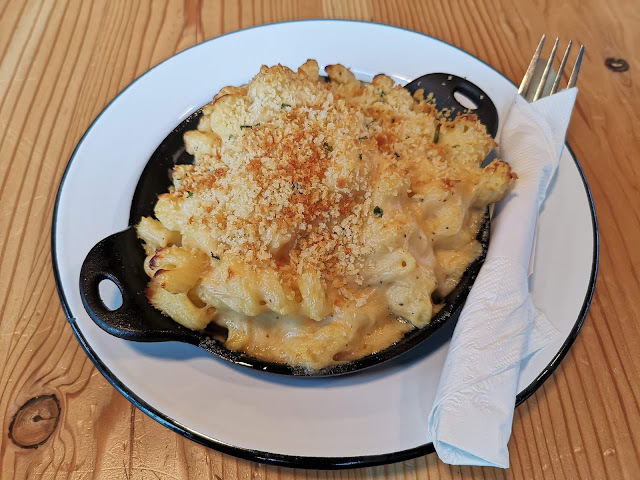 The macaroni was not overcooked for a change, while the cheese was rich and melty and present in every bite. And a nicely crispy bread crumb topping for contrast. This was wonderful! 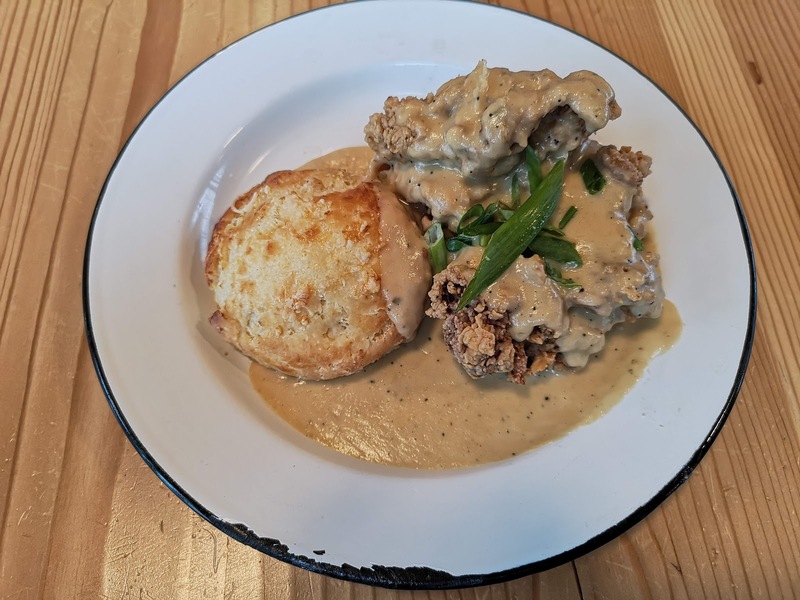 Finally amazing fried chicken with a cheese biscuit and gravy! This was wonderful too! South of the 49th, there are biscuits everywhere compared to metro Van where it seems to be a speciality. 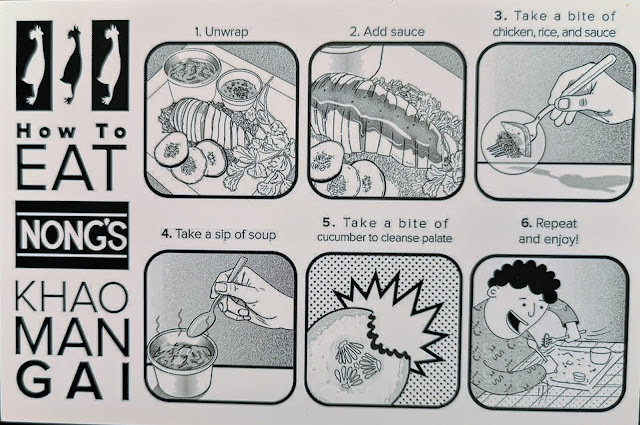 And they often cover them with gravy! 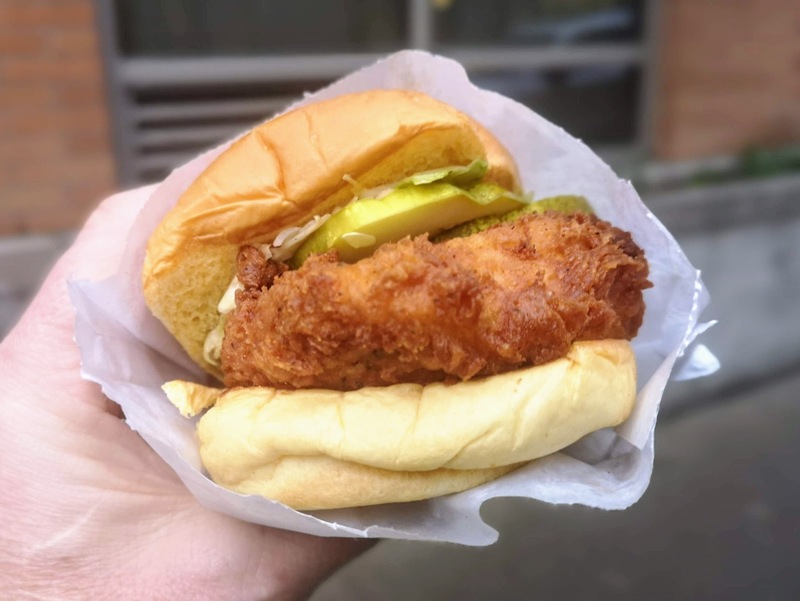 The fried chicken was moist inside (even the white meat) while crispy on the outside. We were in heaven! 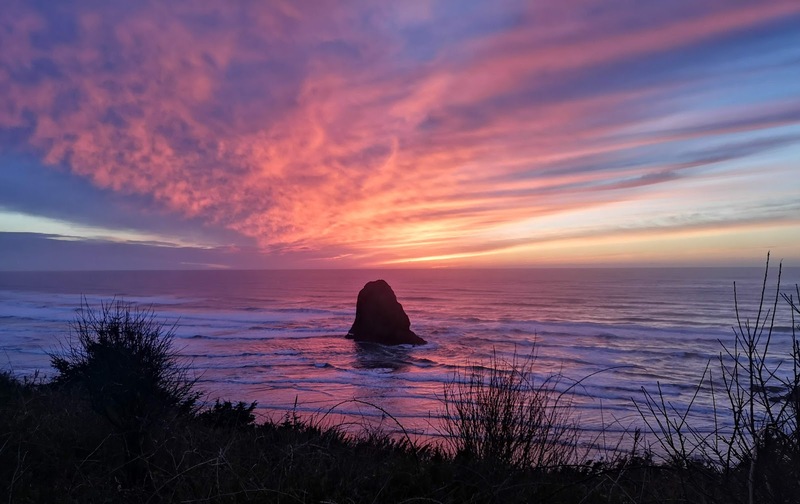 Within those few miles of coastline on the drive home, the terrain changes drastically. From rugged to more sand stretching for miles. As the sun set, we got to thinking about, what else? Eating! For the last thirty years, every time I have mentioned the Oregon coast to my father, he has regaled me with anecdotes about Mo's, so I figured we should try the place. Now, we had realistic expectations. Robert Clarke is not cooking here! We thought some fish and chips might be OK though! 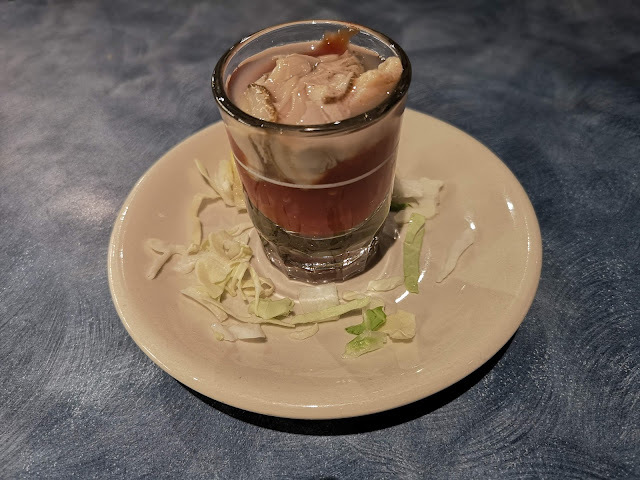 Things started off well enough with a fresh and briny oyster shooter followed by a nice cabbage salad with shrimp. The Combination plate left a little to be desired. Not that there was anything wrong with it but there was nothing great here. 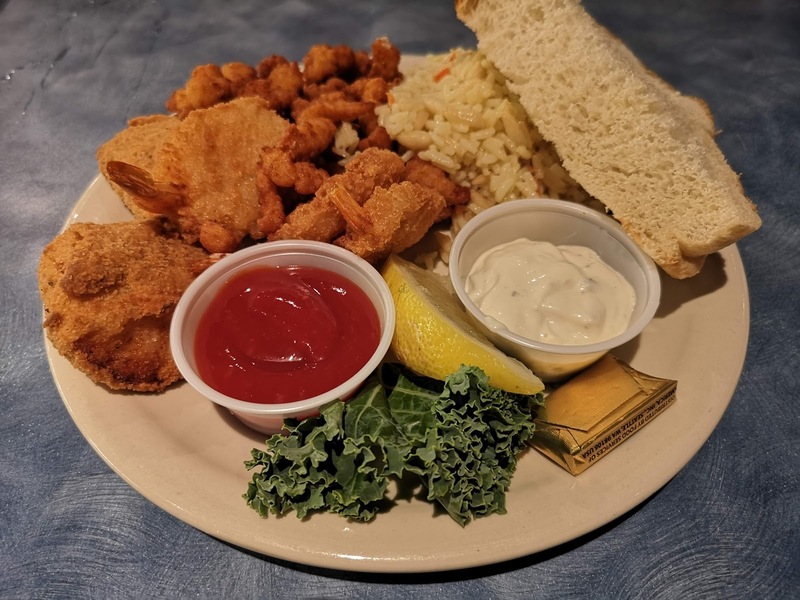 I don't know why I always think clam strips are a good idea. Mostly batter. 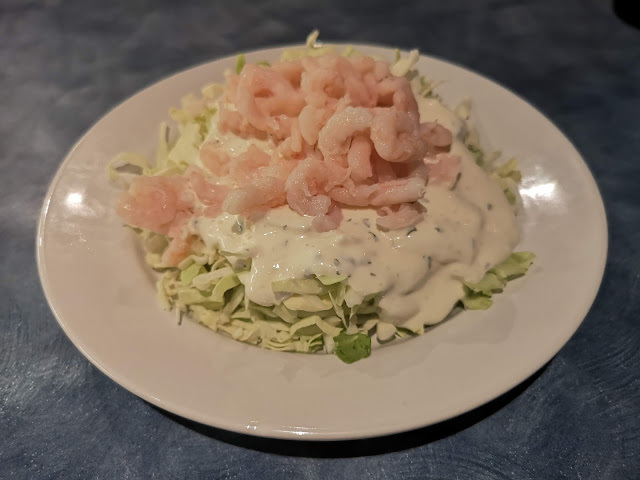 The shrimp were a little too soft while the cod was the tastiest of the plate. 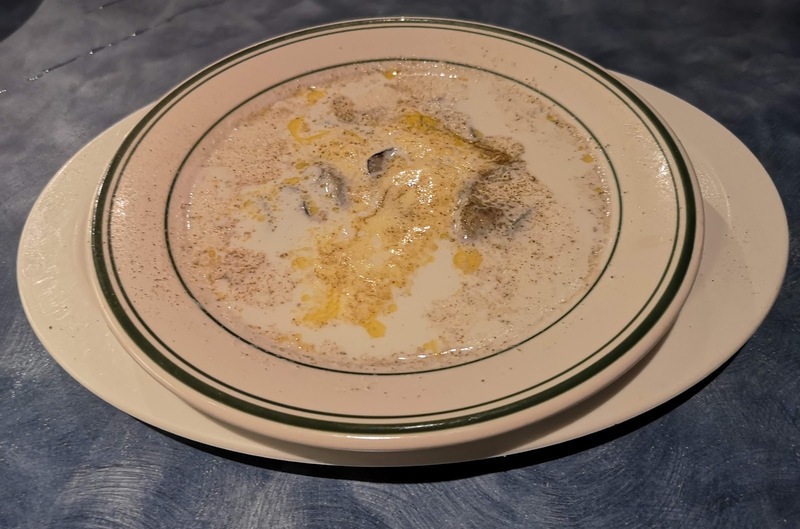 The Oyster Stew was a little on the too soupy side for my tastes but it was buttery and tasty enough. 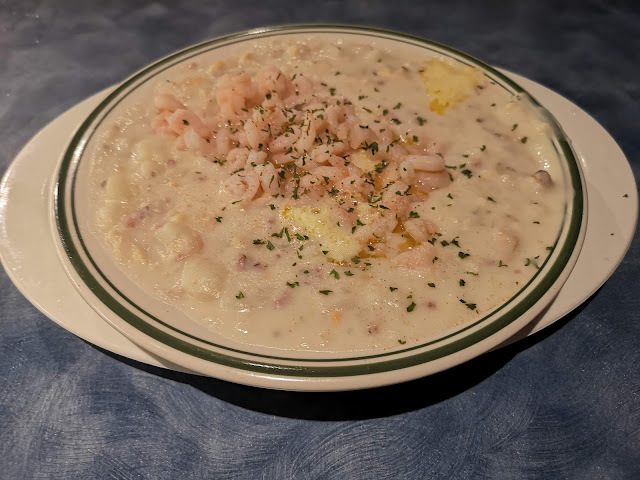 And finally, there was Slumgullion which is clam chowder with shrimp. This was pretty good. Clams were present and it was rich and creamy. The folks were very friendly and service was good. 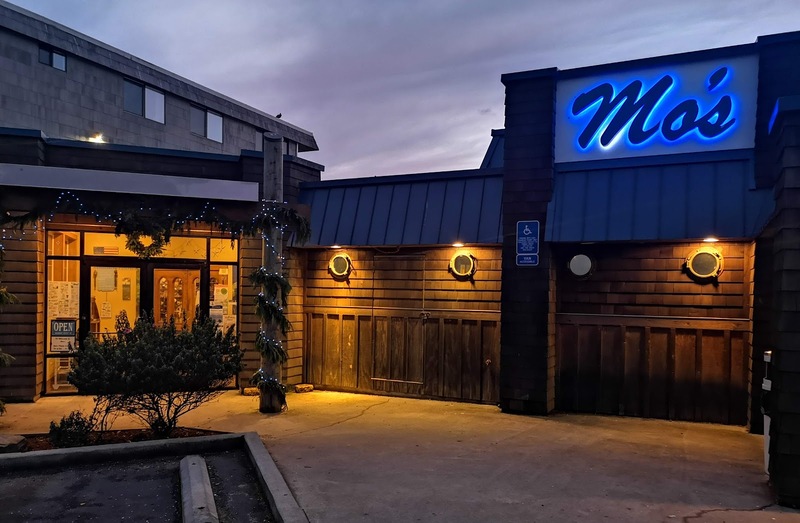 Mo's is kind of an Oregon coast institution with multiple locations. We wouldn't drive to the coast just to go there and we won't be back next time. I will, however, tell my Dad that it was great and assume that he won't read this!